April 12, 1937, is a day in aviation history that changed the world forever. It was also a defining moment for Frank Whittle, an aviation engineer and visionary whose determination outlasted his early failures. On that day, at age 29, Whittle successfully test ran the first practical jet engine. But like many challenges in Whittle’s life, the test wasn’t smooth sailing. In fact, this experience initially paralyzed him with fear. 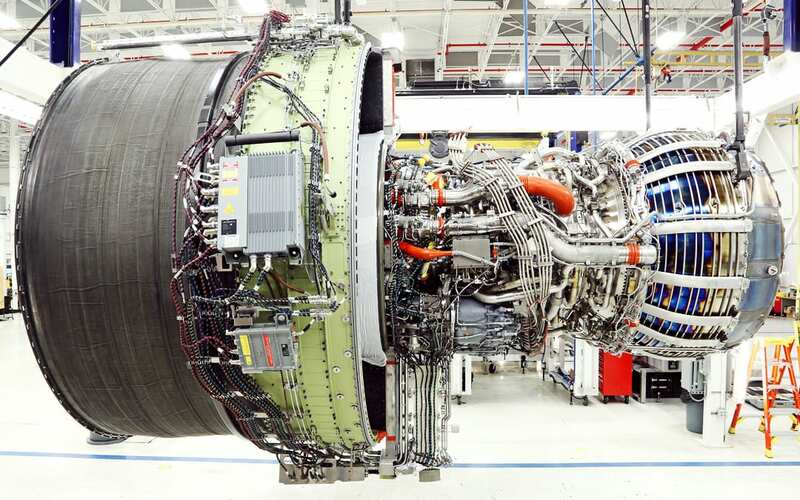 Listen: Q&A with Ian Whittle: Gary Mercer, Vice President of Engineering at GE Aviation, led a Q&A session with Ian Whittle during a recent visit to GE Aviation headquarters in Evendale, Ohio. Ian shares his father’s crazy test pilot stories with the Royal Air Force. It would be another two years, until around 1939, before the engine’s combustion troubles were fixed, according to Ian Whittle. That wasn’t the only issue that plagued Frank Whittle as he worked to develop the engine. Funding was a key challenge from the day he began developing plans for his jet. While enlisted in the Royal Air Force in 1929, Frank Whittle proved by calculation that a turbine had the potential to be the future of air propulsion. His calculations led him to design a two-stage centrifugal compressor with an efficiency of 80 percent that would deliver about a 4:1 compressor ratio to a series of chambers. It would combust 168 gallons of fuel an hour and deliver a thrust of 1,000 pounds. The Whittle engine first flew on the Gloster E28 in 1939. With the support of his commanding officer, Whittle took his design up the chain of command to the Air Ministry. It was later rejected by Alan Arnold Griffith, an engineer for the Royal Aircraft Establishment, who pointed out an error in Whittle’s calculations and deemed his design impractical. The Air Ministry then declined further involvement with Whittle’s plans. In 1930, Whittle patented his idea and worked with Flying Officer Pat Johnson, a former patent examiner, on generating interest. Their sell was met with continued rejection. However, 1935 brought new life to Whittle’s fading hopes. Rolf Dudley-Williams, an old acquaintance, partnered with Whittle and retired RAF serviceman James Collingwood Tinling to rescue the invention. They put a plan in place to gather public financing for the project under the name Power Jets Ltd.
By early 1936, the business got much-needed investment for development. There were still more funding headaches in the years to follow – even to the point where Power Jets Ltd. could barely afford to keep its lights on after Whittle’s first engine run. It wasn’t until the summer of 1939, after Whittle demonstrated a 20-minute, high-power run, that the program was finally legitimized with adequate funding after Air Ministry officials placed their first jet engine order. Over the next two years, newspaper reports described people living near the test-flight area spotting strange planes “that have no airscrews” flying very fast and emitting a high-pitched whistling noise. As World War II surfaced and Germans bombings began and intensified over England in 1941, the British government was worried they could lose both Frank Whittle and the jet engine to a bomb raid. “They really were looking for somewhere for it to get away from the action. They were looking seriously at Canada to develop the jet engine but General Arnold struck an agreement,” Ian Whittle said. That would be United States General Henry “HAP” Arnold, Chief of the U.S. Army Air Corps, saw a demonstration of the engine in 1941. Arnold stepped in to get further development of the engine to take place in the U.S.
Based off Frank Whittle’s drawings, GE was commissioned to rebuild and commercialize the Whittle jet engine by the U.S. War Department and Army Air Corps. A group of GE engineers in Lynn, Mass. called the Hush Hush Boys designed new parts for the engine, redesigned others, tested the engine and delivered a top-secret working prototype called I-A. On Oct. 1, 1942, the first American jet plane, the Bell XP-59A, took off from Lake Muroc in California for a short flight. Whittle died in 1996 at the age of 89. He was inducted into the National Aviation Hall of Fame last fall. Ian Whittle followed in his father’s footsteps. He started with a flying scholarship in 1952 piloting Tiger Moths and Austers. He joined the RAF and flew several British jet fighters including the Meteor, Vampire and Hunter. Later, he moved to Civil Aviation for Kuwait Airways and Cathay Pacific Airways putting mileage on the DC2, Viscount, Comet, Trident, Convair 880, Boeing 707, Lockheed Tristar and the Boeing 747. Today, he continues to fly as an Instrument Rated Private Pilot. What a great movie! Thanks for posting it.